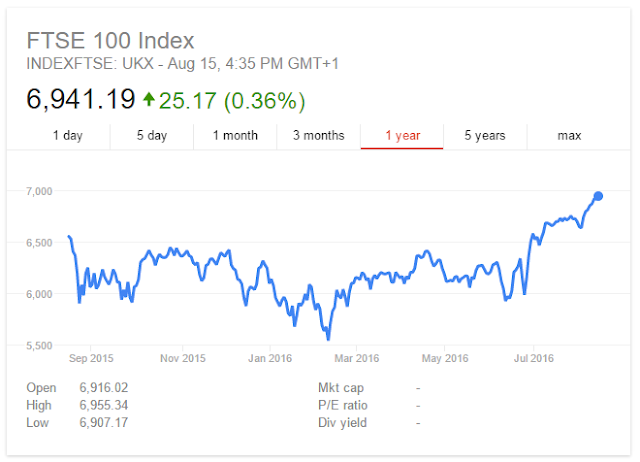 The FTSE 100 and FTSE 250 share indices are racing towards record highs, demonstrating strong investor confidence in the UK. Despite the Bank of England's best efforts to derail the post-referendum boom, the FTSE 100 finished up 25.17 points at 6,941, fast approaching its record high of 7,089 points in April last year. Similarly, the FTSE 250 finished up 7.89 points at 17,929 which saw a record high in May last year of 18,192. In a further show of confidence in the economy, the Bank of England failed to meet the bond buyback target it set itself because investors don't want to sell them. The BoE's latest intervention was to create £1.17bn of free money and use it to buy back bonds but they didn't bank on investors being reluctant to sell their bonds and ended up more than £50m short of their target. The pound will increase in value as time goes on but at the moment the weak pound is a good thing. The Bank of England is pursuing a policy of devaluing the pound (hence it magicking £1.17bn out of thin air) to drive up exports and attract foreign investment. What we sell costs about 10% less to buy in the major currencies since the referendum which increases demand. This in turn creates jobs and new businesses as well as increasing the profile of UK goods and services around the world. Higher prices for imported goods means that it becomes cheaper to buy domestically produced goods and services which again creates jobs and new businesses. The weaker pound is putting us on a much stronger footing for when we eventually leave and the uncertainty of Brexit negotiations is behind us.